Sometimes, things just work out. For a while, it was looking like I wasn’t going to see any theatre this weekend. First, my Sunday evening show (which I had on my calendar for Saturday), “The History Boys” at the Stella Adler Theatre (FB), cancelled on me; luckily, I was able to replace that with another show for Sunday night (based on a recommendation from a Facebook group). Then the show I thought was on Sunday, but which I now realize was Saturday, “Green Grow The Lilacs” at Theatricum Botanicum (FB), cancelled due to the rain. However, in the end, I ended up seeing one of the most inventive, creative, and entertaining shows I have ever seen. Further, after telling my wife about the show, I’m going to be seeing it again next weekend (creating a triple header)… and yes, I checked the dates. 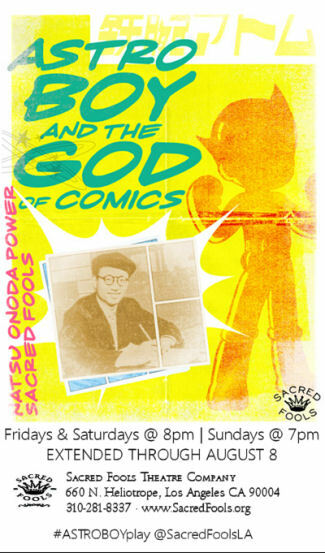 The show, Astro Boy and the God of Comics at Sacred Fools Theatre Company (FB), is about the father of what has come to be known as Anime or Manga, and his greatest creation, Astro Boy. Now, I grew up watching some Manga when I was little — yes, I remember the afternoons of Speed Racer and Kimba: The White Lion on UHF Channel 52. But who knew it as Manga back then — it was just dubbed cartoons. I also have loads of friends into Manga, and relatives that love drawing the stuff. But that was about the extent of my knowledge of the subject. I really never got into it, although I recognized the style. The first inclination that this production is going to be different than anything you have seen begins before the show starts. The stage is covered by a see-through scrim, upon which loads of facts and factoids about anime in general, and Osamu Tezuka in particular, are projected. Suddenly, an animated sign saying “Curtain Announcements” is projected, and you get the typical announcements. During this, you are told that the show will be presented in 13 episodes, and they will be presented in reverse chronological order. An artist walks out, assesses the setup, and opens the scrim. At that point, the title of the first episode is projected and the fun begins. When I first heard “reverse chronological”, two shows came to mind: Sondheim’s Merrily We Roll Along and Jason Robert Brown’s The Last 5 Years. Both of these use a reverse chronological mechanism, and both are hard to initially get into because of it. This is the first show I’ve seen where the mechanism works: we start with the end of Astro Boy, and work our way back to his origins, and then move from the latter days of his creator to the very beginning. The execution of the show itself is unique. If you go to theatre a lot, you have a certain expectations. Actors playing characters, in a somewhat naturalistic set piece. If you see talents other than acting, it might be singing and dance. This show perhaps is best described as manic energy, punctuated with touching meaning. The energy comes at the start, and comes from the actors, the projections, and the drawing. Yes, I said drawing and projections. Look at the two publicity photos I selected at the right. The show starts with actors in coveralls seeing various images projected on what appears to be a white screen on the back of the stage. Suddenly, they start drawing on the screen. And drawing. And tracing. And when they are done — it is a drawing of Astro Boy. Suddenly, they are running and ripping down what they have just drawn, and the episode begins. This is how the show continues. There is interaction with projections. There is constant drawing on the back, on paper, on pages. There are clever puppets (which made me think of the recent Entropy at Theatre of Note). There is Heather Schmidt (FB) as a perfect energetic and innocent Astro Boy. There is manga style. There is manga energy. It is just a remarkable imaginative staging you really have to see to believe. Lets get some of the credit for this out of the way: The show was written by Natsu Onoda Power, and directed by Jaime Robledo (FB). I’ll cover the production staff in detail later, including the various assistants; suffice it to say this show would not be what it is without them. 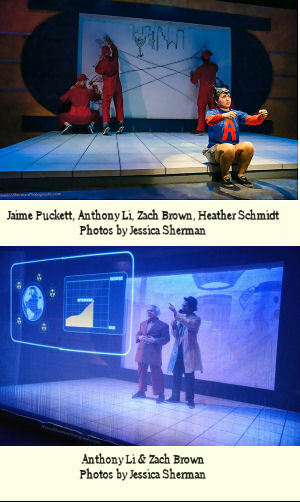 This is one of the first shows where I have seen projections be more than a backdrop — they became an additional actor. It is just a remarkable concept and conception. There are just so many scenes from this show that left remarkable impressions. There was the episode where we learn of Astro Boy’s final mission. There was the robot auction. There was the assembly of Astro Boy. There was the wonderful introduction to Osamu Tezuka and his unique personality, told by his assistants, interns, and wife — with each drawing something that ended up being a self portrait of Osamu. There was the haunting episode about Japan during the war. There were scenes that were entirely silent — evoking silent movies to a great extent — and there was a fair amount of plain silliness. It was just so memorable and creative. The actors for this show didn’t come across as your traditional stage actors: they had a role and a script and played a character. In fact, the only two real characters were Heather Schmidt (FB) as Astro Boy and West Liang (FB) as Osamu Tezuka (and even then they occasionally joined the ensemble in other roles). Schmidt was.. was… was…. perky and cute and hyper and joyful and… embodied Astro Boy in both performance and telegraphed attitude. Liang was more serious as Tezuka, but even he got into the fun occasionally. He made you believe he was Tezuka … and that’s a great compliment. The remainder of the ensemble became particular characters at times, but were more themselves in coveralls, portraying the story by frantic drawing, movement, pantomime, performance, and craziness. The ensemble consisted of Zach Brown (FB), Megumi Kabe (FB), Anthony Li (FB), Mandi Moss (FB), Jaime Puckett (FB), and Marz Richards (FB). You’ve heard of triple threat actors. I don’t know about their singing, but these guys are a different type of triple threat: actors, dancers (for what else would you call that closely choreographed movement on stage), and graphic artists. It is hard single any of them out for they each played great roles — I particularly remember Kabe’s portrayal of Osamu’s wife, Li as the head of the robot academy, Richards selling robots, Moss and her fuschia hair as an assistant, … well you get the idea. All are great. Then there are the folks you only see briefly (or don’t see at all, but are there in spirit). There is a video of Osamu when he was young that I actually thought was real video … then I discovered they also shot that for the show with Scot Shamblin (FB) [Tezuka’s father], Jane Kim (FB) [Tezuka’s Mother], and Sebastian and Percival Africa [Young Tezuka]. Understudies were Erin Sanzo (FB) [Astro Boy], Scot Shamblin (FB) [Osamu Tezuka], Gregory Guy Gorden (FB) [Ensemble], Lisa Anne Nicolai (FB) [Ensemble], and Aviva Pressman (FB) [Ensemble]. I said at the beginning it was the production and technical staff that made this really special, so let’s start naming some names. It is really hard to single out one particular production aspects from another in this show — they blend together that well. The lighting (I noticed some quite effective use of movers and LEDs), the sound effects and music, the projections, the props, the puppets, the costumes, the overall set design that brought everything together. They made a seamless whole (with the possible exception of near the end, where I kept getting some odd flashes as if the projection went down for a split second and came back). The production team consisted of: Brian W. Wallis [Lead Producer / Technical Supervisor], Aviva Pressman (FB) [Live Art Director (I’m guessing this is the “Live Art” equivalent of Dance Captain 🙂 ], Rebecca Larsen [Assistant Director], Shaunessy Quinn [Associate Producer (Design/Tech)], Seamus Sullivan/FB [Associate Producer (Casting/Outreach)], Carrie Keranen (FB) [Marketing Coordinator], Heatherlynn Gonzalez (FB) [Stage Manager], Suze Campagna (FB) [Assistant Stage Manager], DeAnne Millais (FB) [Scenic Design], Matt Richter (FB) [Lighting Design], Linda Muggeridge/FB [Costume Design], Brandon Clark/FB [Prop Design], Natsu Onoda Power [Puppet Design], Jaime Robledo (FB) [Sound Design], Ryan Johnson/FB [Original Music], Mike Mahaffey [Stunt/Fight Choreography], Joe Fria [Suzuki Trainer], Anthony Backman [Production Video Design], Jim Pierce [Projection Animation Design], Danielle Heitmuller [Animation Painter], and many more. Lucky for you, Astro Boy and the God of Comics has been extended through August 8. Go see it. I liked it so much, I’m willing to see it again with the same cast — which I rarely do. Tickets are available through Sacred Fools, and may be available through Goldstar and LA Stage Tix. Upcoming Shows: July is a month of double-headers. Next weekend is a triple header: “Lombardi” at the Lonny Chapman Group Rep (FB) on Saturday July 25th, with the annual Operaworks show the next day in the afternoon, followed by seeing Astro Boy again in the evening at Sacred Fools Theatre Company (FB). August continues the craziness, with a double header at Theatricum Botanicum (FB) the first weekend: “As You Like It” on Saturday, and the rescheduled “Green Grow The Lilacs” on Sunday. The second weekend of August is equally busy, with “The Fabulous Lipitones” at The Colony Theatre (FB) on Friday, our summer Mus-ique show on Saturday, and Concerts on the Green in Warner Park (with a Neil Diamond cover band) on Sunday. The third weekend of August is calmer, but only because we moved theatre off the weekend because my wife is driving my daughter’s car back to the bay area. As for me, I might very well go back to see the revised “Jesus Christ Superstar” at REP East (FB) — they are returning to have live music and I expect that will make a significant difference. The third week of August may see us back at REP East (FB) for their “secret seventh show”, which has been revealed to be “A Company of Wayward Saints“. After that we’ll need a vacation … but then again we might squeeze in Evita at the Maui Cultural Center (FB) the last weekend of August. September right now is mostly open, with the only ticketed show being “The Diviners” at REP East (FB) and a hold-the-date for “First Date” at The La Mirada Theatre for the Performing Arts (FB). October will bring another Fringe Festival: the NoHo Fringe Festival (FB). October also has the following as ticketed or hold-the-dates: CSUN’s Urinetown (end of October – 10/30 or 11/1); “The Best of Enemies” at The Colony Theatre (FB) (Ticketed for Sat 10/10); and “Damn Yankees” at Cabrillo Music Theatre (FB) (Ticketed for Sat 10/17). As always, I’m keeping my eyes open for interesting productions mentioned on sites such as Bitter-Lemons, and Musicals in LA, as well as productions I see on Goldstar, LA Stage Tix, Plays411.